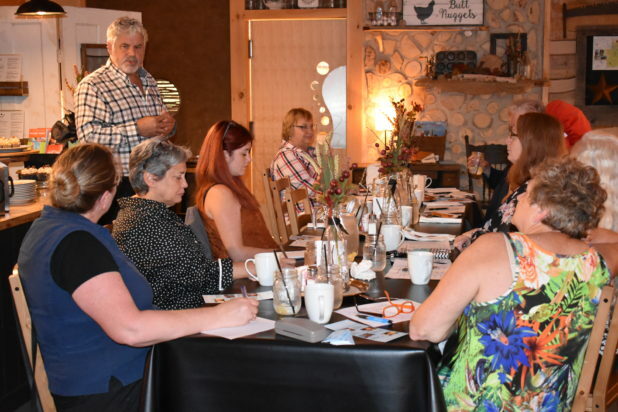 The sounds of issues being discussed were mixed with laughter at the Wattle and Daub Cafe on Tuesday, Sept 18, as ladies from several different businesses got together to talk about their concerns and triumphs of running their own businesses. This was the Cafe’s first Women in Business Dinner of the year and the 10 participants went from being complete strangers at the entrees to business contacts by dessert. The special guest speaker for this event was County of Hastings’ small business coordinator Mark Hanley. He works with the county to assist people starting new ventures as well as those experiencing challenges in their existing businesses. Hanley offers his services to all small businesses within all 14 municipalities that are in the County of Hastings, including Bancroft. Hanley says that he comes to Bancroft at least every second week to work with entrepreneurs one-on-one to talk with them about their business and any issues that they may be having. Before working with the county Hanley started and grew many of his own successful businesses and has assisted hundreds of business owners in his previous roles of small business adviser, college instructor, investor and enterprise facilitator. Hanley talked with the participants about knowing their strengths, weaknesses and most importantly their target customers. He also explained that every business is divided into three portions, the product or service, the marketing and the financial management and that every small business owner tries to manage all three portions. However, this usually doesn’t work out well as most people are not proficient enough in each area. This often leads to the businesses failure because one person cannot handle everything. Hanley suggested that instead of trying to do everything, finding help and knowledge within the business owners’ network of people would be a better option. “People say they can’t hire someone to help because they can’t afford it,” said Hanley. If business owners are looking for assistance or advice Hanley welcomes people to contact him at 613.391.0350 or email him at hanleym@hastingscounty.com. The Women in Business dinners take place usually on the third Thursday of every month, with a different topic at each event. Those interested in participating are asked to stop in at Wattle and Daub Cafe or look the cafe up on Facebook to RVSP their seat at the dinner table.